IF THE SKIES are clear next Sunday, you might be able to see comet dust raining fire. The Perseid meteor shower occurs in mid-August every year when Earth passes through a stream of dust no larger than a grain of fine sand that remains from the tail of successive passages of comet Swift-Tuttle. Earth's atmosphere runs into the comet dust, like a windshield hitting a cluster of flying insects. The particles enter the atmosphere at speeds of upward of 133,000 mph. Friction slows them and heats them to the melting point. They vaporize before hitting the ground but leave a streak that we see as a "shooting" or "falling" star. 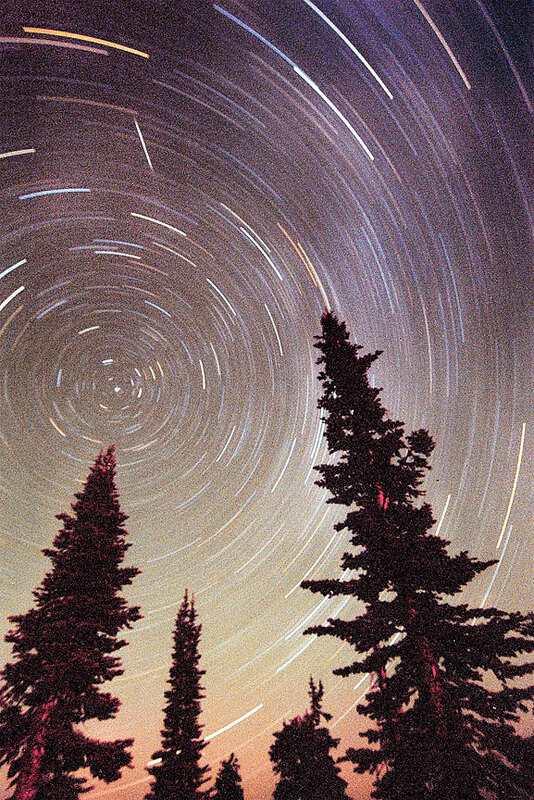 When Earth travels through the stream of dust, we see a meteor shower. Depending on where Earth and the stream meet, meteors appear to fall from a particular place in the sky. The Perseids appear to emanate from the constellation Perseus, which will be rising in the northeastern sky just before midnight on next Sunday's moonless night. Comet Swift-Tuttle, which orbits the sun every 130 years, has a nucleus that is about 6 miles across. It is the largest object that makes repeated passes near Earth's orbit. Although the orbits of Earth and Swift-Tuttle cross, there is little chance of a collision, at least until the year 3044. Calculations indicate that a "near miss" of about 1 million miles (four times the distance to the moon) might occur in that year. Collisions of Earth with interplanetary debris became of great interest after the physicist Luis Alvarez and his son Walter, a geologist, announced in 1980 their theory that a comet or asteroid some 6 miles in diameter had slammed into Earth 65 million years ago and was ultimately responsible for the extinction of the dinosaurs. Before the extensive use of remote sensing Earth satellites, scientists thought that there had been few geologically recent impacts with Earth. Most Earth scientists would have said that impacts were small in size and rare in occurrence. The Alvarezes' theory expanded our perspective on impacts and caused us to rethink them. As remote sensing satellites gave clearer pictures of other worlds in the solar system and located many more vestigial craters on Earth, including the one believed to be the result of the dinosaur-killing impact, it awakened a new awareness and concern over the possibility of future collisions with large objects. To date, nearly 170 impact craters have been identified on Earth. Their sizes range from a bit less than 100 feet to 180 miles. Now we understand that impacts are much more common than previously believed. Although the impact by interplanetary debris has slowed drastically from the early days of the solar system's formation, it is not finished. Earth is constantly bombarded with cosmic dust, about 100,000 tons a year. The larger the object, the less often the impact, but impacts with enough energy to form a crater 12 miles across occur an average of every million years. The composition and structure of comets is the topic of intense interest and research both for the disaster potential of impacts and for helping to answer questions about the origin of the solar system and life. COMETS ARE thought to be "dirty" ice balls that originate in the hinterlands of the solar system in the Kuiper Belt or the Oort cloud. The Kuiper Belt is a disk-shaped region of icy debris lying outside the orbit of Neptune that is thought to be the source of short-period comets, those with orbital periods of less than 200 years. Its collection of icy objects, KBOs -- Kuiper Belt objects -- are an emerging area of research in planetary science, especially since two were discovered that are larger than Pluto, leading to the recent demotion of Pluto from planet to KBO. No spacecraft has ever traveled to the Kuiper Belt, but NASA's New Horizons mission, planned to arrive at Pluto in 2015, might penetrate farther into the Kuiper Belt to study these presumably icy objects. There are at least 35,000 KBOs greater than 60 miles in diameter by current estimates, any one of which might at some time have its orbit perturbed by one of the giant planets and cross inside the orbit of Neptune. There, it might be ejected from the solar system after a gravitational sling encounter with one of the giant planets, or it could continue into the inner solar system to become a short-period comet. Another source of comets is the Oort cloud. This is a spherical region that overlaps the Kuiper Belt and extends three light-years (190 thousand AU or 18 trillion miles) from the sun. The Oort cloud is considered to be the boundary of the solar system where the sun's influence ends. It extends more than halfway to the nearest star. It contains billions of icy bodies, all in solar orbit. A gravity wave from an exploding supernova or a disturbance from a passing star causes one or more of them to fall into the inner solar system and whip around the sun. Then it slowly disappears as it heads back to the outer reaches of the solar system, never to be seen again or possibly to return in hundreds or thousands of years. Two important space missions are designed to gain firsthand knowledge of the composition and structure of comets. Stardust, launched in 1999 by NASA, traveled more than 3 billion miles to pass through the tail of comet Wild 2 and return to earth in 2006 with particles of the comet's tail embedded in blocks of frothy silica gel. Rosetta was launched in March 2004 by the European Space Agency. To gain enough orbital energy to reach its target, comet 67P/Churyumov-Gerasimenko, Rosetta will require three gravity assists from Earth and one from Mars on its 10-year journey to the comet. Rosetta's objective is to orbit the comet and observe its nucleus and coma. While Rosetta orbits, the comet will reach the closest point to the sun in August 2015, allowing it to measure the increase in activity of the comet as it heats up. Prior to perihelion, a lander will attempt to make the first-ever landing on a comet. The primary goal of this growing interest in the details of comets is to ascertain whether they could have brought both water and organic chemicals that were the seeds of life on Earth. It is a combination of our continuing quest to find out where we came from, how likely it is that our planet has the only life in the universe, and how likely we are to become victims of the next major impact.